Cats Protection’s Woking branch is celebrating ‘Mature Moggies Week’ from 13-17 November. It’s a shame that older cats stay with us longer as they have a lot to offer. Their characters are fully formed and they’re less likely to scale the curtains or knock your ornaments off the shelf! Older cats can often still be quite playful when they choose to be and many enjoy a few short games each day. Figures from the charity’s centres show that cats aged 11 and over spend an average of 33 days waiting to be adopted – twice as long as the overall average time of 15 days and over four times longer than kittens, who wait an average of eight days. Cats Protection conducted a survey to understand why many ‘senior kitizens’ are being overlooked in favour of fresher-faced felines. 23% of respondents say they would consider any cat aged over five years as ‘older’, whereas a five-year-old cat is only 36 in human years and a cat generally isn’t classed as ‘older’ until it reaches 11 years of age. Character and medical history were the most important considerations for people choosing a new cat (87% and 83% classed them as important respectively), followed by age (68%). Just 24% of respondents would be likely to consider an older cat, compared with 68% of respondents who would be likely to consider getting a kitten. Less than 4% knew the equivalent human age for a one-year-old cat is 15 years old. The majority (69%) thought it was five years old. Only 16% knew the equivalent human age for a five-year-old cat is 36 years old. The most popular answer (38%) was 25 years old. Top reasons for not considering an older cat were that it might not live long (72%), it would be more likely to get ill (56%) and if unwell it would cost money (40%). 19 % of people were unlikely to consider an older cat said one of the reasons was that older cats are not very playful. Owners of older cats stated: they are calmer (58%), they don’t want to leave the house as much (54%) and it feels like they are more of a family member (52%). Cats Protection says improvements in cat care have greatly raised the life expectancy and quality of life for household moggies, with many now living into their late teens and early 20s in remarkably good health. HAVE A LOOK AT OUR GORGEOUS MATURE MOGGIES BILLIE AND PURDY; WHY DON’T YOU COME AND MEET THEM? All cats adopted from Cats Protection have been fully health-checked and come with a full medical history and four weeks’ free pet insurance which also covers new conditions. 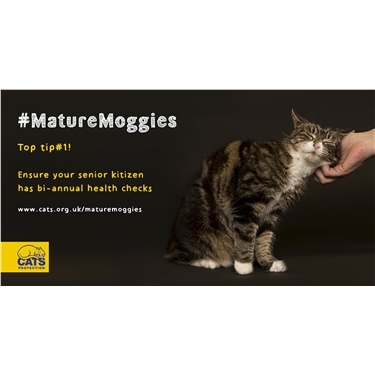 During Mature Moggies Week, Cats Protection will be asking people to share stories about their own cats as well as providing educational messages and advice to those who either own or are thinking about adopting an older cat.